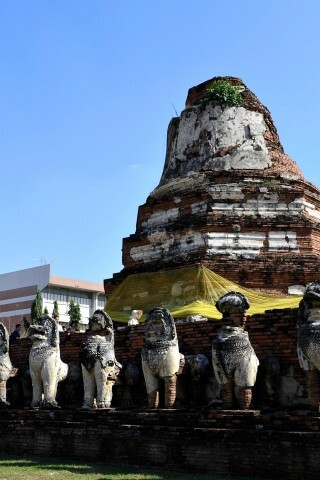 Located midway between Wat Phra Si Sanphet and Wat Ratchaburana and with entrances from two of Ayutthaya’s best-known roads, Wat Thammasikarat is somehow overlooked by most visitors. Those who give it a chance are rewarded with impressive lion sculptures and a reclining Buddha image that ranks among Ayutthaya’s finest. One of the few large sets of ruins in Ayutthaya that are now part of a working Theravada temple, Wat Thammasikarat (also spelt Thammikarat) was probably established under the name Wat Mukkharat prior to the founding of Ayutthaya, making it one of the oldest ruins in the area. In the early 17th century, King Songtham rediscovered it, constructing an enormous assembly hall to house a giant bronze Buddha head. While the Buddha head is now exhibited at the Chao Sam Phraya National Museum, the hall’s unusually high brick platform and massive pillars can still be explored today. Across the lawn is a brick chedi rimmed by plaster sing (lion) guardian statues, a few of which still display fine detail. Arguably Wat Thammasikarat’s highlight is a 12-metre-long reclining Buddha image known as Phra Phutthasaiyat, which lies in a cramped hall of the same name. Covered in gold leaf and with gilded feet featuring glass mosaics, the image was created when Songtham’s queen wished for their daughter to recover from a sickness. Wat Thammasikarat is located between Uthong Rd and Naresuan Rd in the north-central part of the island, with entrances on either side. If heading between Wat Ratchaburana and Wat Phra Si Sanphet on Naresuan Road, you’ll see a long driveway marked by an English sign. Admission is free.